Best tyres for ktm duke / rc 390. better than metzeler. Recommended Rim Width: 7.5 "
We also trade into world renowned tyres like Apollo. These tyres are light in weight and provides less inertia to the springs while riding over a bump, which ensures smoother rides on all type of road conditions. 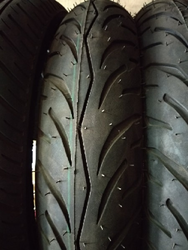 These tyres are weather proof and are fit for all types of road conditions. Clubbed with the direction of efficient and elegant testing units being installed at our premises, we have been engaged in offering with Apollo Actigrip Bike Tyre.